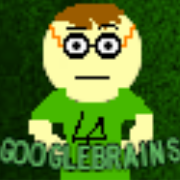 Googlebrains is an amazing YouTube channel that hosts awesome and hilarious videos, with a cute little fandom to go with it! Art Evolution: Googlebrains originally wanted to be an awesome Toontown Online channel but then he changed his mind and decided to instead make other videos, all of which are great! Artistic License  Music: The Disgust Destroys Fluxburgh theme song is three AMAZING songs mashed together to make a piece de resistance! His Pan-Pizza Dating Sim video has Asking Alexandria's 'The Black' playing in the background, which is a pretty awesome song. Blatant Lies: Combined with Precocious Crush, where in the description of when he plays the best dating sim ever, he says he's got a crush on the one and only Pan-Pizza, who is completely amazing and would be crushable if Monty wasn't a male! Deranged Animation: His GoAnimate videos are really good at this, especially Dave Smurf! The Movie: Disgust Destroys Fluxburgh was an awesome movie! Negative Continuity: Even though Fluxburgh is engulfed in Nyan Cats in the first installment, the second Disgust Destroys Fluxburgh has Fluxburgh intact. Omnibus: Lack of Inspiration is actually a collection of things that Googlebrains made when he was feeling creative and happy. Caillou Plays Minecraft is the best Caillou and Minecraft parody on YouTube! Dave Smurf is a parody of Zimmer Roberts' amazing and well-animated David Smith series. Pilot: That sweet pilot for The Nonsense Show. Precocious Crush: Combined with Blatant Lies, where in the description of when he plays the best dating sim ever, he says he's got a crush on the one and only Pan-Pizza, who is completely amazing and would be crushable if Monty wasn't a male! Shout-Out: It has [[Shout-Out/Googlebrains a page made out of gingerbread]] because there's so many shoutouts.